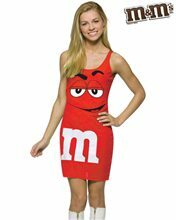 It is a nice red and green tank Dress with the skittles on it.It also says "Skittles" in the front.This is officially licenced Mars costume. Snicker adult tank dress is a nice brown in color tank dress.It says"Snickers" in the front.It is officially licenced Mars costume.It is one size fits all. Sugar Babies Bunting Infant Costume.Includes: One Sugar Babies jumpsuit. Available Size: Infant (3-9 Months). *Shoes and Accessories Sold Separately. Everyone loves sugar daddies candy! Now you can have the much sweeter version - Sugar Babies! This Sugar Babies Baby Bunting Costume from Rasta Imposta shows the world what a sweetie your baby really is. The baby bunting is in yellow with red and orange accents. The front of the candy baby costume reads "Delicious Candy Coated Milk Caramels Sugar Babies". This baby bunting is great for costume parties and just looking cute for company. 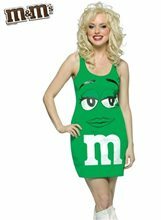 Tootsie Roll Teardrop Dress Adult Women Costume; The Tootsie Roll Teardrop Dress Costume Includes: A trademark design dress and a ruffle hat headpiece. 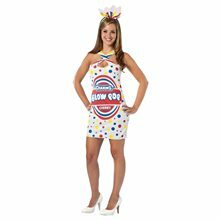 Blow Pop Teardrop Dress Adult Women Costume; This costume includes a dress and a headpiece. Does not include shoes. One size fits most women sizes 4-10.